Finishing NaNoWriMo – and now what? 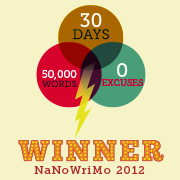 As much I’ve enjoyed Nanowrimo, I especially enjoyed going over the 50,000 word mark and finishing yesterday evening. I’m off work this week and all the way through I’d focused on finishing the writing just before so that I could properly enjoy my time off. So I could read all the books I’d saved up, catch up on films and tv shows etc. And yet, as happened last year, I finished and suddenly felt that sense of disappointment that it was over. Now I can always go back to that first draft and add more to it, edit etc. But in a way it’s a bit like Christmas, you spend all of that time planning and then suddenly it’s there and it’s a bit of an anticlimax. This will pass of course, I can already feel it passing, but despite the fact that I knew it was going to happen, it’s still not something that I can avoid. Something that I do need to avoid for a while, however, is typing since my rsi is back. So it’s just as well that I have a week off. I’ve avoided knitting today for the very same reason. Posted in: Craft Room, Writing.